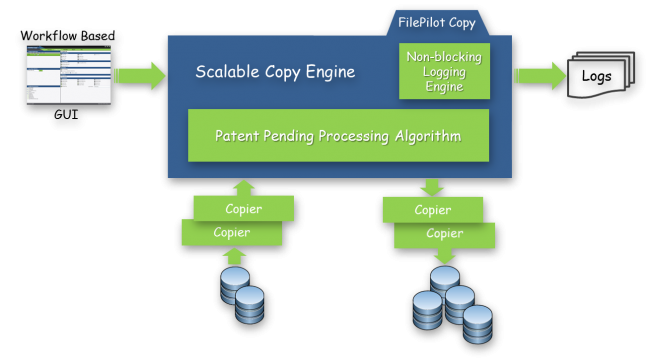 Built around an optimized multi-threaded architecture, FilePilot Copy’s patent-pending data movement engine will push your infrastructure; servers, NAS and network, faster than you thought possible. Moving file systems of up to hundreds of terabytes of data is no longer a sit and wait proposition. The data movement engine was conceived and developed from the outset to move data faster. While many enterprise file systems are commonly uniform in their structure and composition, they can contain very large, sparse, small and zero byte files, as well as deep sub-folder structures and empty folders. The presence of any of these can affect the speed at which they are processed through a data mobility solution. The FilePilot Copy data movement engine is designed to dynamically adapt to variances within a file system without slowing down. A data mobility initiative is only successful if every event and transaction is captured and documented. The logging capabilities of a data mobility solution must be able to keep pace with data movement and not impact overall performance or lose any information. FilePilot Copy’s non-blocking logging engine ensures that all transactional and event related data is processed at line-speed and can be viewed in real-time as it is created.